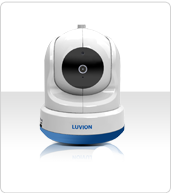 Separate camera with an UK plug for the Luvion Prestige Touch 2 baby video monitor. Please note that this camera only functions correctly with the Prestige Touch 2 and is not suitable for use with other models. 1. Switch manually between multiple cameras. 2. Loop/switch automatically between multiple cameras. The monitor will switch to a different camera every 3 seconds.